Delighted to go off of Henry Island on Monday June 18, 2012 to see J and L Pod families swimming north, with the almost 10’ flooding summer tide! They were spread out miles from each other, it was like a whale parade of 50 to 60 or more whales!! The Center for Whale Research folks were out taking photo identifications, so they will post the results. We were grateful to witness breaches, spy (sky) hops, tail lobbing, and foraging behaviors. To see the physically close families with many mothers and youngsters closer to shore, while older females and males tended to be out in Haro Strait, gave guests an insight to the culture and life long bonds these whales share. A group of males brought up the rear and began porpoise swimming, 2 together in synchronicity!! The rain and fog on Saturday June 16, 2012 didn’t seem to bother J-Podders! Of course they’ve adapted to their wet ocean world. We circumnavigated San Juan Island, and like the whales went with the strong flooding tide. Over the years I have seen more surface active behaviors off of Henry Island, compared to other areas, so I was very thankful we were able to see J-2, 101 year old matriarch, Granny in the lead of spread out groups. The sprinkles had stopped, the sun broke through the clouds, a whale breached and others tail fluke slapped the water! Then did Granny vocalize “come here!”? 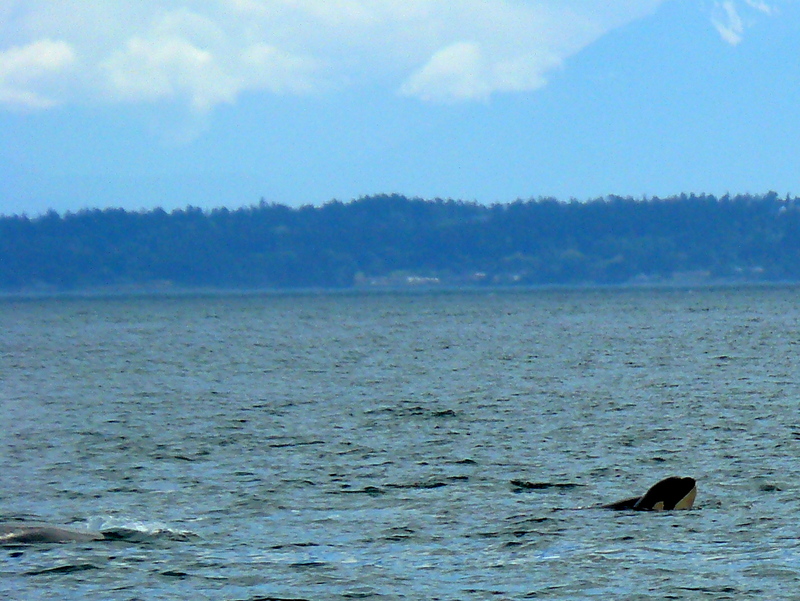 as Balcomb’s Orcas porpoised and sped swam toward Granny’s groups and Stuart Island.